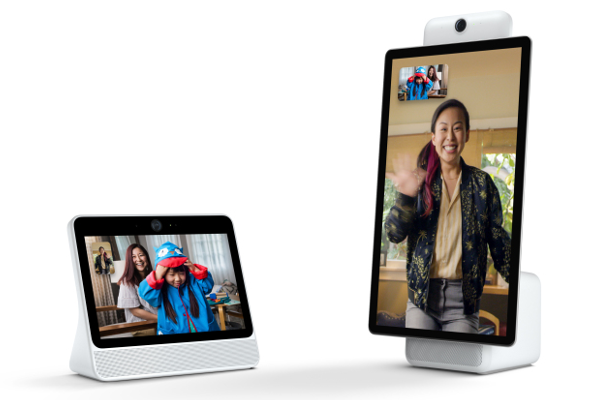 Facebook unveils Portal and Portal+ video calling devices with Alexa built-in. Today, Facebook announce Portal and Portal+, two new video communication devices for the home. Portal is an in-home connected smart camera that lets you video chat with the ones you love with hands-free tracking, a wide-angle lens, and a voice enhancing microphone. With a 10-inch 1280 x 800 display, Portal from Facebook improves video calling. You can also opt for a 15-inch 1920 x 1080 pivoting display with Portal+. Powered by AI, Portal's Smart Camera and Smart Sound technology take all of the guesswork out of video calling, letting you enjoy a more convenient, hands-free experience. Whether you're cooking in the kitchen or chasing the kids around the living room, Smart Camera stays with the action and automatically pans and zooms to keep everyone in view. Smart Sound minimizes background noise and enhances the voice of whoever is talking, no matter where they move. Portal offers hands-free voice control. You can start a video call simply by saying "Hey Portal" and noting who you'd like to call. Portal also has Amazon Alexa built in, so you have access to a robust voice experience to ask for sports scores, check the weather, control smart home devices, order groceries, and more. Portal also enables shared activities like listening to music together or watching some of your favorite shows. Facebook partnered with Spotify Premium, Pandora, and iHeartRadio, as well as Facebook Watch, Food Network and Newsy. Facebook also incorporating augmented reality (AR) effects - powered by its Spark AR platform - to make calls even more fun and interactive. Story Time brings stories to life with custom sound effects and visuals. Smart Camera helps you read a fun story via a simple teleprompter, perfectly framed, while your loved ones on the other side watch as your face and voice transform into the story's characters. And when you're not on a call, Portal's Superframe can display your favorite photos and videos and important notifications like birthday reminders, so you always feel a little more connected to your closest family and friends. Portal and Portal+ are available now for pre-order in the US - from Facebook at portal.facebook.com, as well as Amazon and Best Buy - and will begin shipping in November. You can bring Portal home for $199 USD and Portal+ for $349 USD. You can also receive $100 USD off any two devices - this means a bundle of two Portal devices will be priced at $298 USD.